So there’s some debate whether it’s pronounced “pay-stee” or “pah-stee.” Whichever the case, it’s a reference to what we good-hearted ‘mericans would call “pastries” (leave it to the dastardly Brits to try and confuse us by naming their snack-foods after stripper gear.) Anyways, check out their website, cuz it’s pirate to the core. It’s also a damn site more fun to explore than some pirate computer games. You know, those ones that you find for $5 at OfficeMax in a giant bin [cough-BlackBuccaneer-cough]. Pirate heroine inspires County Mayo – The Boston Globe. I thought this was going to be an article about a new Grace O’Malley Mayonaise. But no, it’s just about an Irish county that really, really likes O’Malley. The Irish county of Mayo – hense the confusion. I suppose that a town rallying around a pirate is a good thing – I certainly endorse the idea. But I am still quite let down that there will be no Irish pirate queen condiments gracing our stores. I always approve of businesses adding a little pirate flair to their endeavors (well, not always – there was that Pirates of the Carrots and Peas debaucle). But usually I do endorse such efforts – and such it is with the Coffee Pirate. Pirate themed coffee drinks served out of a pirate themed RV. Works for me. And that they’re bravely pimpin’ the pirattitude in Wisconsin of all places only earns them more kudos – we need all the pirate fun we can get in the Midwest. Oooh! Pirate themed tea in a can! Really now, how could I see this on the supermarket shelf and NOT buy it? It’s made with rum and has a pirate on it, for cryin’ out loud! I slathered it all over my dinner that very night. Fortunately it was barbeque chicken night – had it been speghetti night things might have turned ugly. Sadly, the bottle is the best part of this marinade. The flavor claims to be “rum butter,” but the butter was all I tasted. And butter just doesn’t seem like an appealing barbeque flavor. I was ready to write this stuff off, but then it was suggested I might try marinading corn on the cob with it next time around. Now there’s an idea! I’ll let you know how it turns out. Although experienced in rums, the vast world of rum-cakes is largely uncharted territory for me. 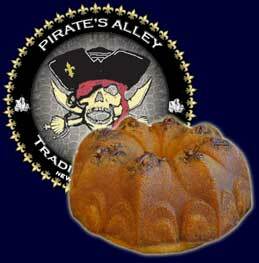 So when Pirate’s Alley contacted me and offered to send “the finest rum cake on the planet,” it seemed a fine time to broaden my horizons. The cake, as chance would have it, arrived on my birthday, thus proving that Pirate’s Alley not only has fantastic cakes, but impeccable timing. Posted in Other	| Tagged food, pirates alley trading co.